So if you’re in town, stop by the Prentis store. We’d like to see you. The Pursuit of Happiness: Furniture for Leisure and Entertainment. While it is a very broad topic, it presents an opportunity to focus on a good variety of pieces, topics, and woodworking techniques. The official description, schedule, as well as registration information can be found through the link above. Here are some of the pieces we’ll be covering in January. We’re excited to feature guest speaker Alfred Sharp this year who will demonstrate the construction and decoration of this mid-century Philadelphia card table from our collection. Alf, a recipient of the Society of American Period Furniture Maker’s Cartouche Award for lifetime achievement, has published and lectured widely on traditional furniture making and brings a perspective informed by deep experience with both traditional and contemporary building techniques. 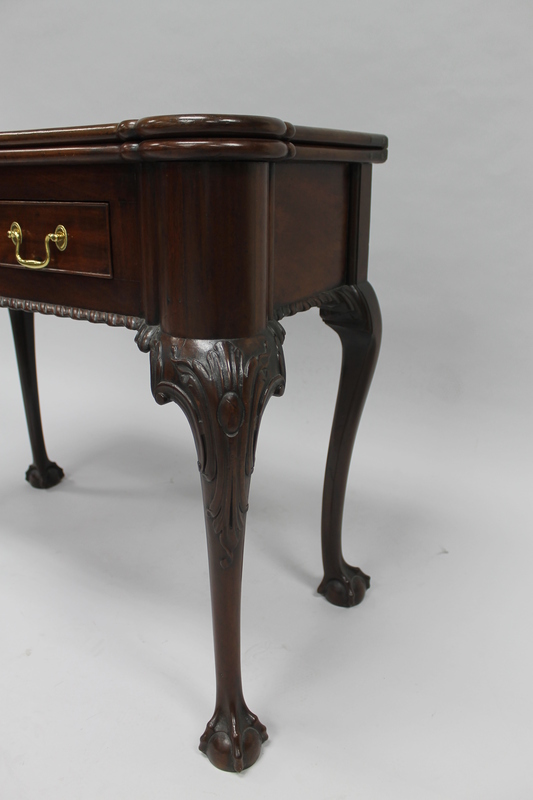 Here is a closer look at some of the mahogany table’s carved features. 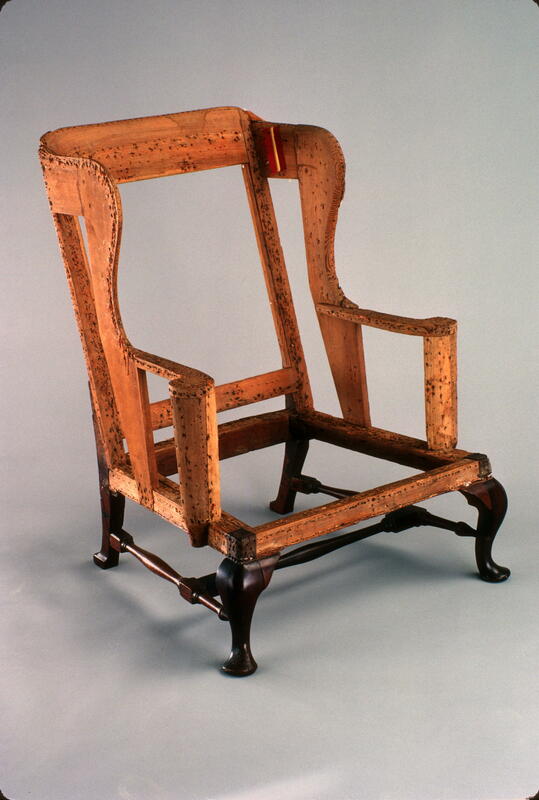 Cabinet shop supervisor Kaare Loftheim and Colonial Williamsburg’s conservator of upholstery Leroy Graves will explore and demonstrate the construction and upholstery on an easy chair attributed to the original Hay Shop. This will be the first time we’ve had a chance to sink our teeth into more complex upholstery at the Symposium. Easy Chair (1989-372), Williamsburg, VA. Attributed to the shop of Anthony Hay, ca. 1750 – 1770. 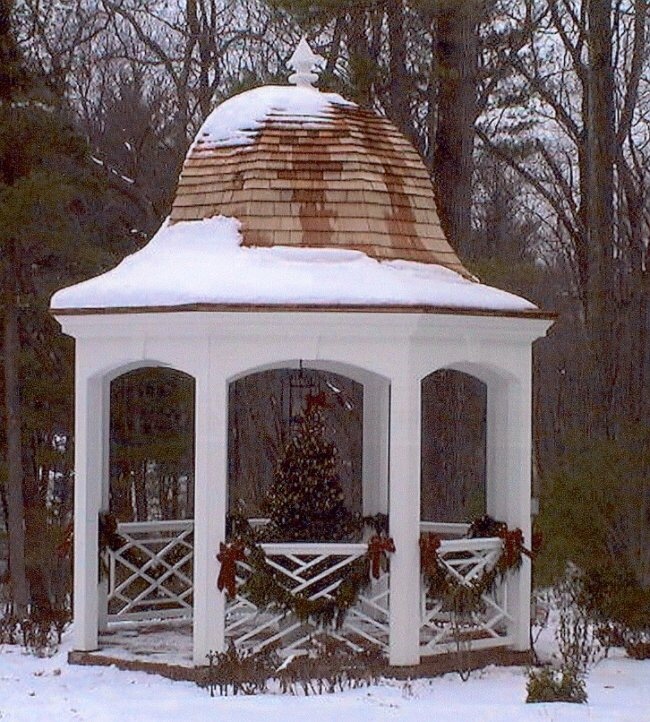 For something equally suited to relaxation in an upscale manner, and also unexplored in past symposia, joiner Ted Boscana will demonstrate some of the work required to build a stylish gazebo. While he won’t build the entire thing onstage (I hope you understand why), this will be our first look at a freestanding outdoor structure. Snow and seasonal decor may or may not be featured in the program. 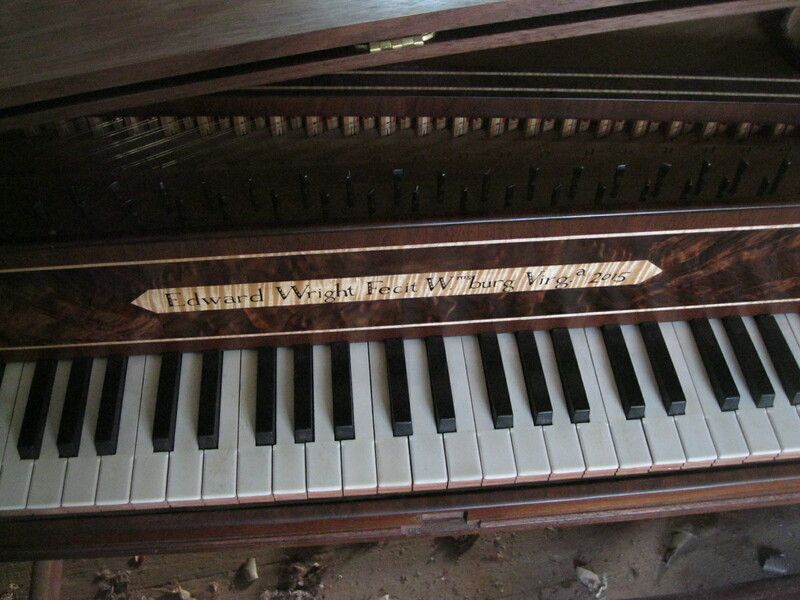 For some the pursuit of happiness has a soundtrack so to that end harpsichord maker Edward Wright will walk attendees through some of the structural, mechanical, and decorative work that goes into making a spinet. 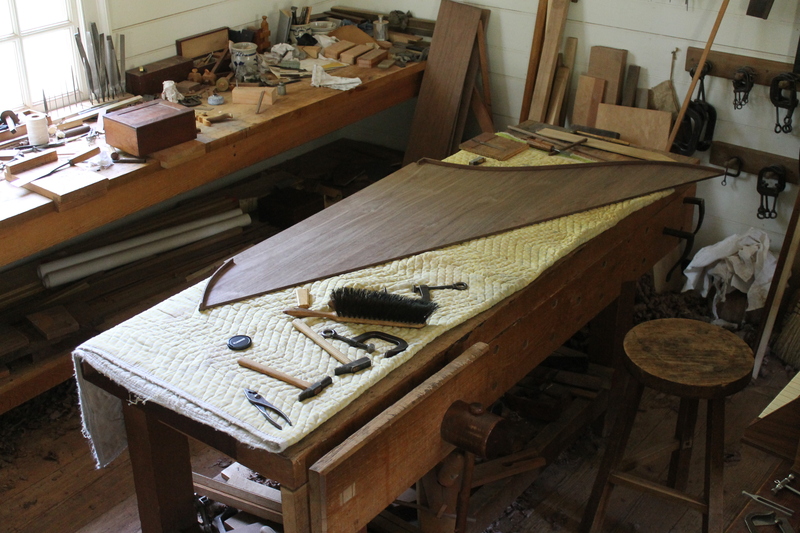 Perhaps you’re thinking that spinet making is not in your future, no matter, the techniques and tools involved in this work can all be employed in or adapted for cabinetmaking. 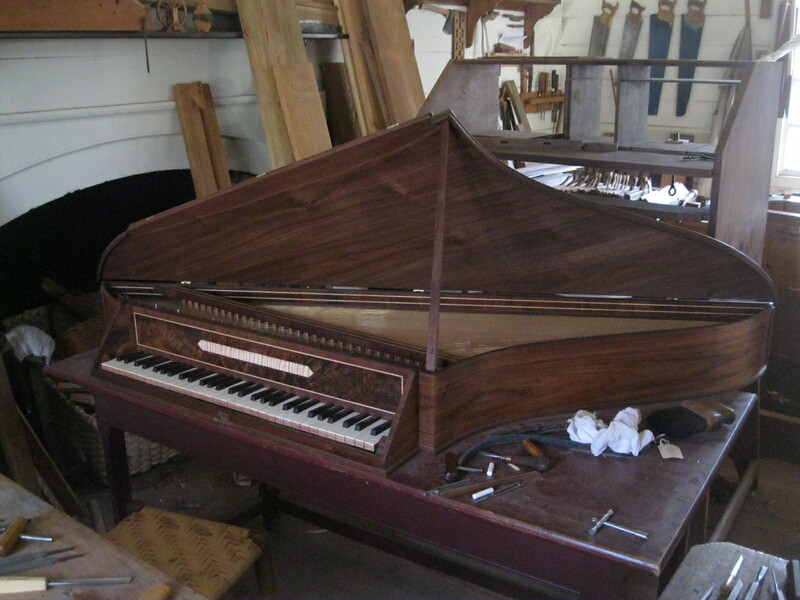 Besides, this program just might convince you that making a spinet would be more worthwhile than making yet another workbench or tool chest – you never know. 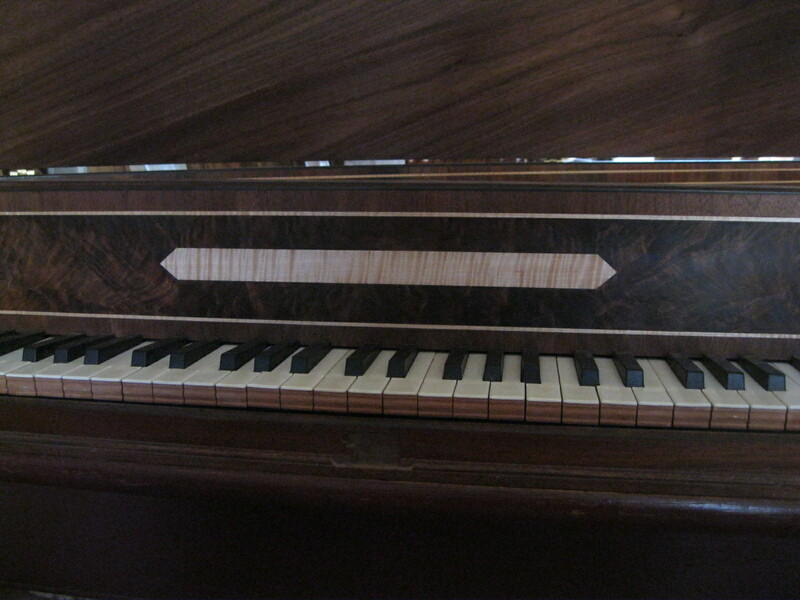 Spinet (1960-321), London, made by Cawton Aston, 1726. 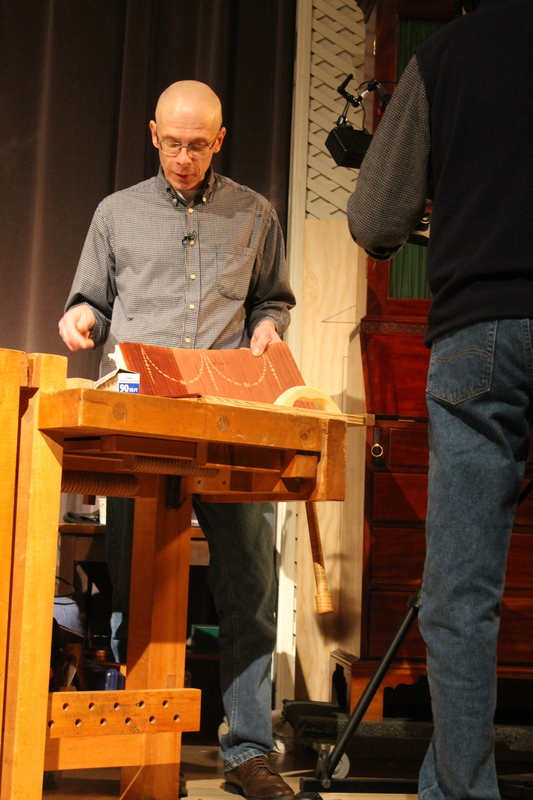 Cabinetmaker Bill Pavlak will explore various approaches to making tripod base music and reading stands. 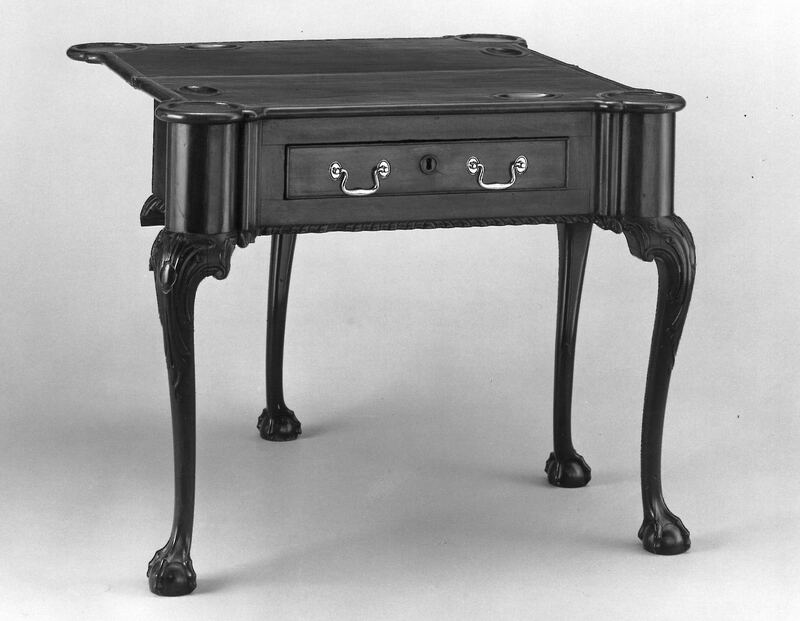 Such pedestal bases could also be used to support frames for needlepoint and other sewing work. The presentation will focus in part on working with period pattern books. Plate XXVI form The Universal System of Household Furniture by Ince and Mayhew, 1762. If your search for happiness leaves you thirsty or if thirst quenching is an integral part of your pursuits then these next pieces may be of some interest. 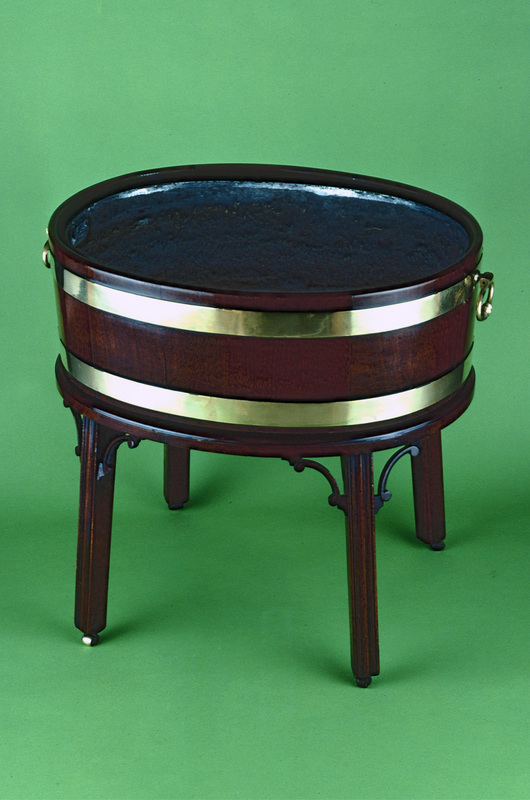 Colonial Williamsburg Cooper Jonathan Hallman along with cabinetmaker Brian Weldy will demonstrate the construction of this coopered mahogany wine cooler on stand (apparently Messrs. Bartles & Jaymes didn’t know what a wine cooler really was. Hallman and Weldy will set them straight). 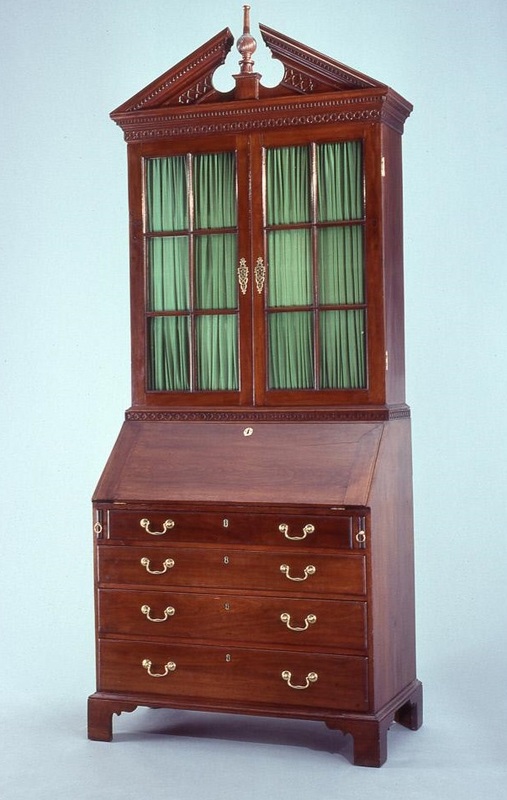 Wine Cooler (1989-368), England, ca.1760. 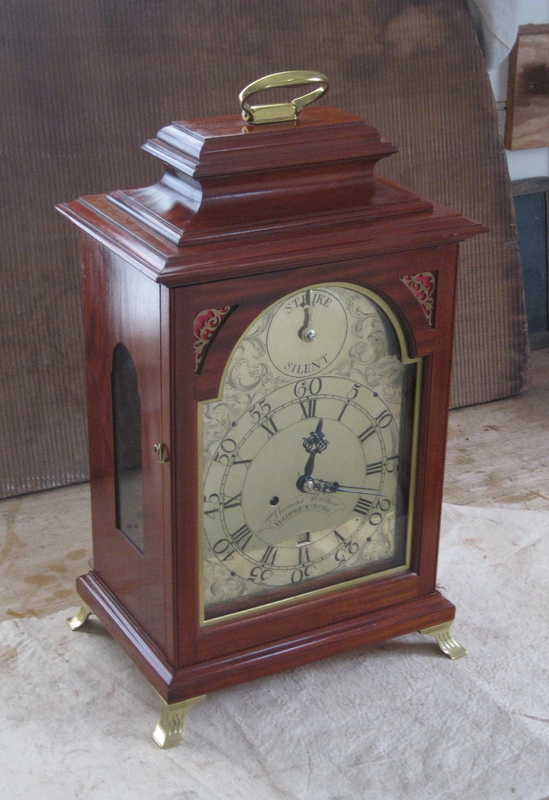 Mr. Weldy will also explore a much more ornate wine cooler that he’ll scale down to the size of a tea caddy. This will allow us to not only look into the intricate carved patterns and alternate approaches to coopered construction, but also into the issues that arise in scaling pieces up or down in size. 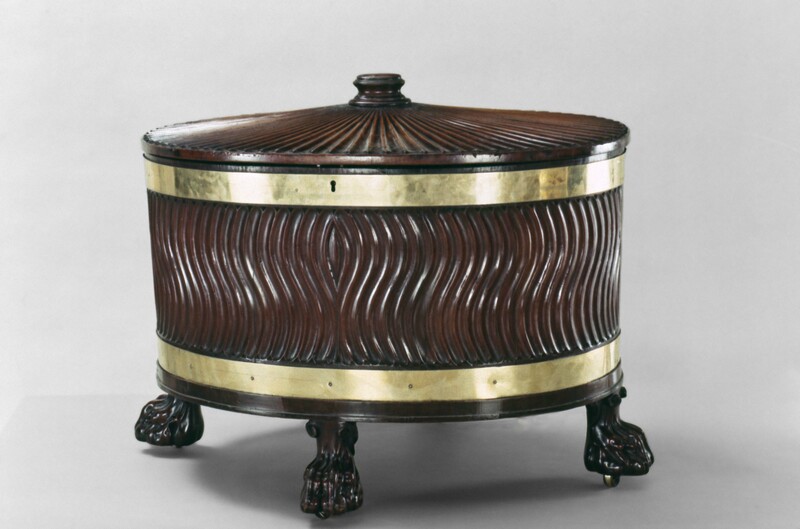 Wine Cooler (1972-343), England, 1755-65. What else? Furniture curator Tara Gleason Chicirda will open the conference with an illustrated overview of eighteenth century leisure activities and the material culture surrounding them. Later in the conference she’ll present a brief look into the structure of a period billiard table and curator Jan Gilliam will share some of the wooden toys in our collection. 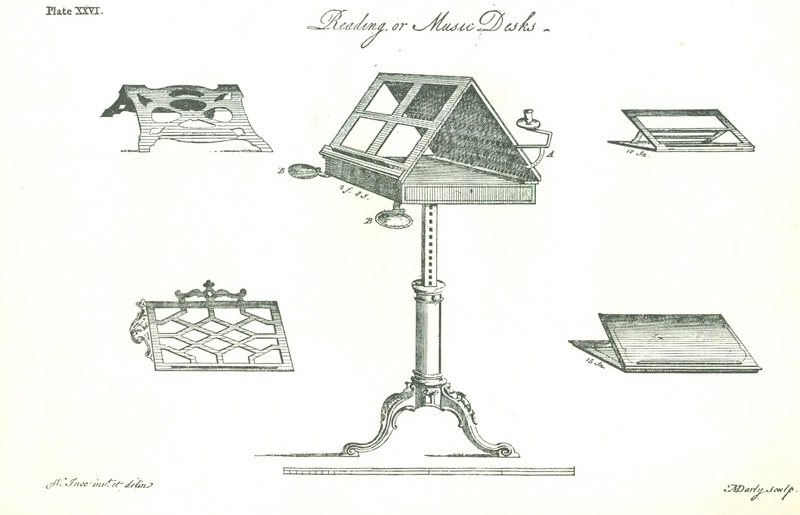 Special guest, independent scholar Jane Rees, will join us once again – this time to discuss gentlemen’s tools and tool chests (in other words the really fancy tools used by well-off amateurs). Many of you will know of Jane through her co-authorship of the book on the Benjamin Seaton tool chest, if not her many other publications on the history of tools and technology. What else? We’ll have a panel discussion with all of the presenters as we did last year, a tool swap, optional tours of our conservation facilities, a banquet with a yet to be determined presentation, an opening reception with drinks, breakfasts, plenty of opportunities to talk to fellow cabinetmakers at all levels of skill and experience and much more. As some of you may know the long awaited bracket clock works arrived last fall. 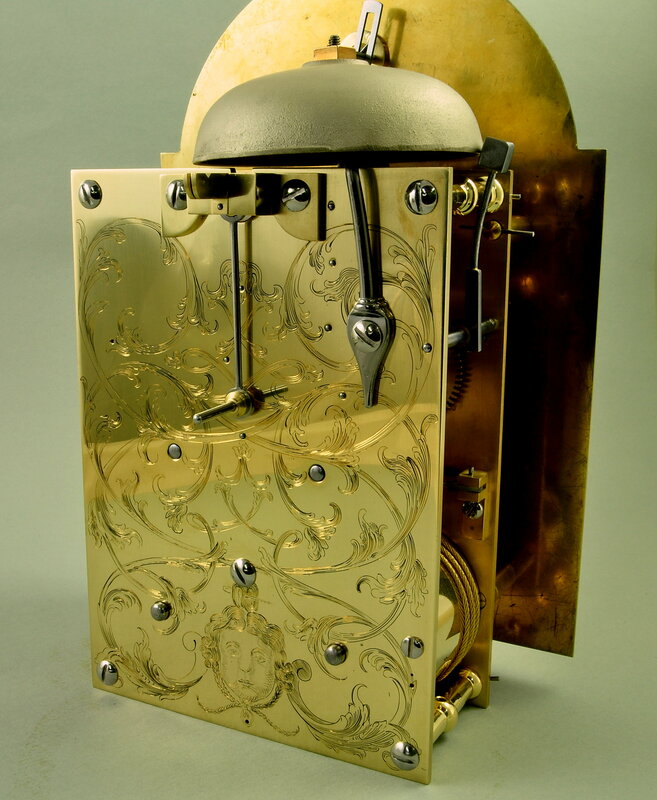 The works, made by clockmaker David Lindow of Lake Ariel, Pennsylvania replicate the original set by 18th century Fredericksburg, Virginia clockmaker Thomas Walker. 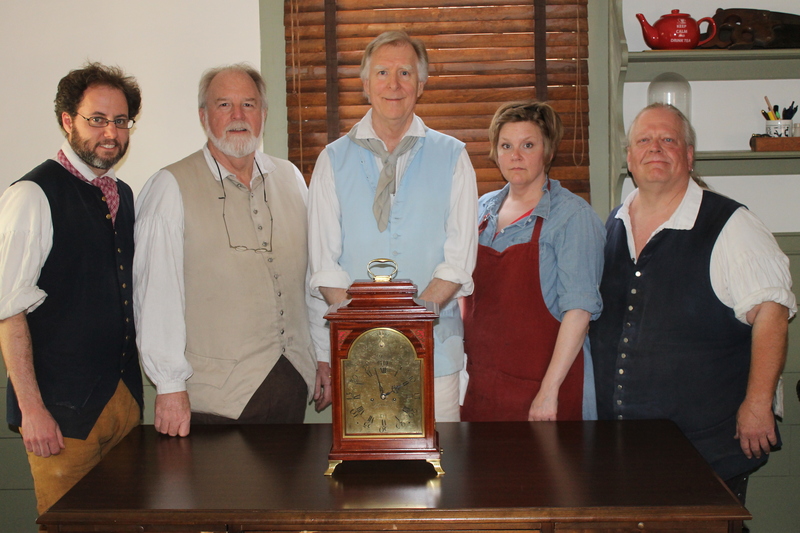 The clock was one of the subjects presented in our 2013 Symposium: Working Wood in the 18th Century; Small Things Considered, and was the product of a great team of talented Colonial Williamsburg tradesmen. From left to right: Bill Pavlak, journeyman cabinetmaker, planed the base and cornice molding; George Suiter, master gunsmith, engraved and blackened the Arabic and Roman numerals; Kaare Loftheim, journeyman supervisor cabinetmaker, framed up the case, doors, and cap; Lynn Zelesnikar, master hand engraver, executed the decorative detail on the clock face and back plate; and Mike Noftsger, journeyman brass foundryman, cast and polished the brass feet. 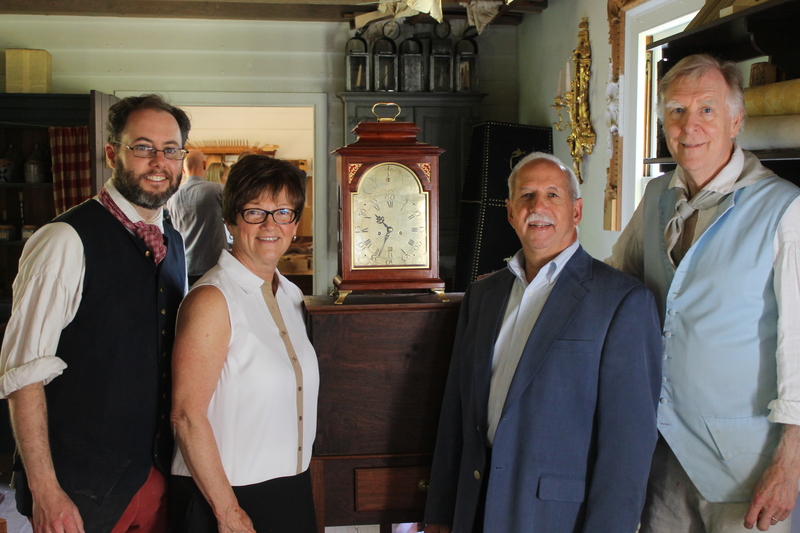 Work on the clock was closely followed by a local couple who finally took possession of it this spring.Their appreciation is a great source of satisfaction for all of us. It’s been a long time since I’ve posted on this site. Work has rolled along and time has passed me by, like always for us all. But I finally have something to show for the efforts. You see it here. 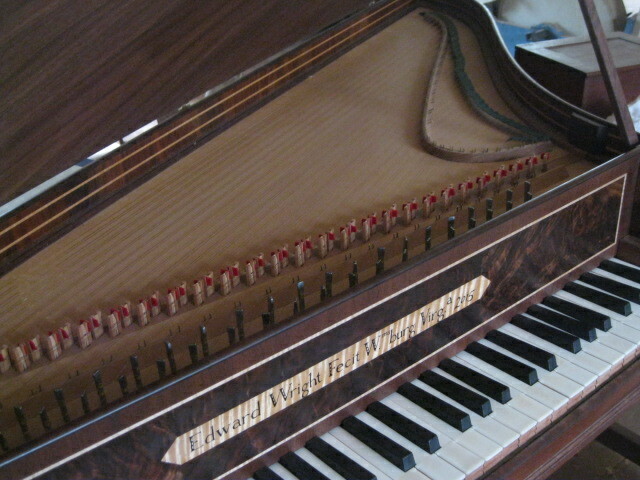 The work has ranged from assembling and installing a spruce soundboard, making cherry bridge and nuts, moldings, forging the heads of tapered pins for tuning pins, making an apprentice (Yes, I had one for about eight months) cut and shape brass pins to hold the strings, the actual stringing, making a lid, cleaning brassware from the Geddy Foundry across town… oh, yes, and making everything work for its main purpose: music. 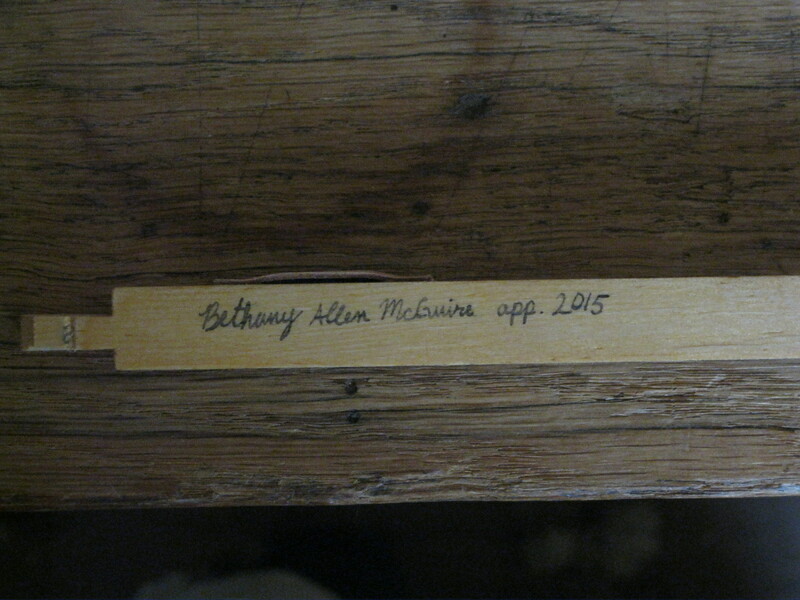 My former apprentice, Bethany Allen McGuire, came at just the right time, since it takes two people to effectively string up this instrument. We had individual duties in the process for each string. Bethany quickly became adept at spinning the hitch loops for the wire, while I worked on drilling technology (something I will post about soon). The first couple of strings in the bass each took over a half hour to get in place. But soon we were up to about five or six an hour. Hearing each string pull up to pitch and the spinet making its first sounds… that kind of excitement spurred us on. Then we had to mount the action and keyboard, a seemingly endless process. For Bethany, this was a good introduction to how spinets really work. I’m just glad it’s staying together. 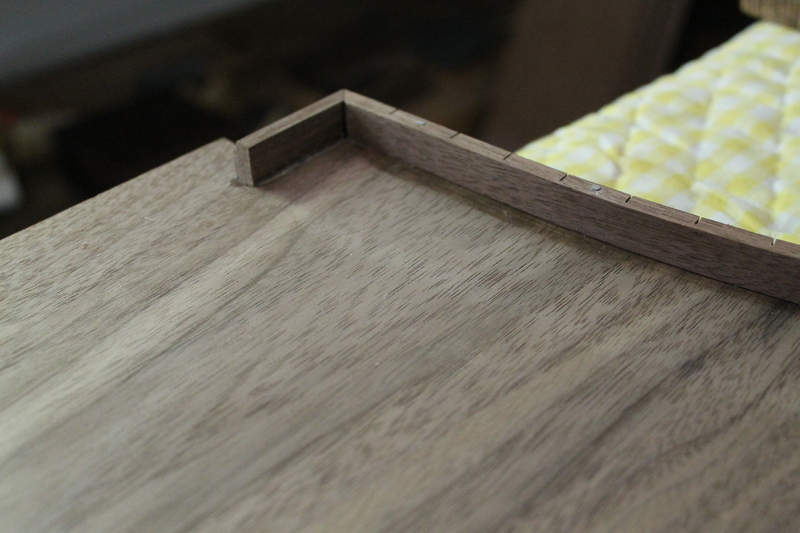 We teamed up for assembling the lid, four pieces of black walnut edge-glued, she cut it to shape while I made the moldings and we both worked on kerf-bending and installing them. It was one of the fastest lid assemblies I can remember. Front Corner Joint of Lid Moulding. Note the kerfs to bend the long strip. No inscription yet here. Bethany gave me a complete surprise when she said she had done calligraphy before. I just about fell down on the floor, for I had really been wondering how to solve that problem. With a bit of instruction and the loan of a few good tools from cooper Ramona Vogel-Hill (who also works calligraphy on the side), Bethany worked on the block printing while I experimented with surface treatments to prevent the ink from feathering into a mess in the wood grain. Experimental Inscription on Curly Maple. The maple was planed smooth with my try plane with a tight throat. Then I abraded it with fine emery paper. I know what you are all going to say, WHA? IT WAS ALREADY SMOOTH! True, but I sanded it down very finely and left the dust in place. Then a very thin cut of seedlace varnish, one coat, was applied, then left to dry for a half hour. It would seal the dust into the pores. A very, very light sanding with emery to remove any possible blemishes in the surface and then Bethany went to work. How do you determine success here? Well, for me, if the wood is clear and smooth enough, the lettering should look like it floats above the surface of the wood figure. A visual depth should result that almost looks three dimensional, as if you could pass you fingers behind the letters but above the curl figure of the maple. All the walnut casing is finished with three coats half boiled linseed oil, half spirits of turpentine. Final top coating will be beeswax. Unfortunately, Bethany left us at the end of last month, and I was sorry to see her go. 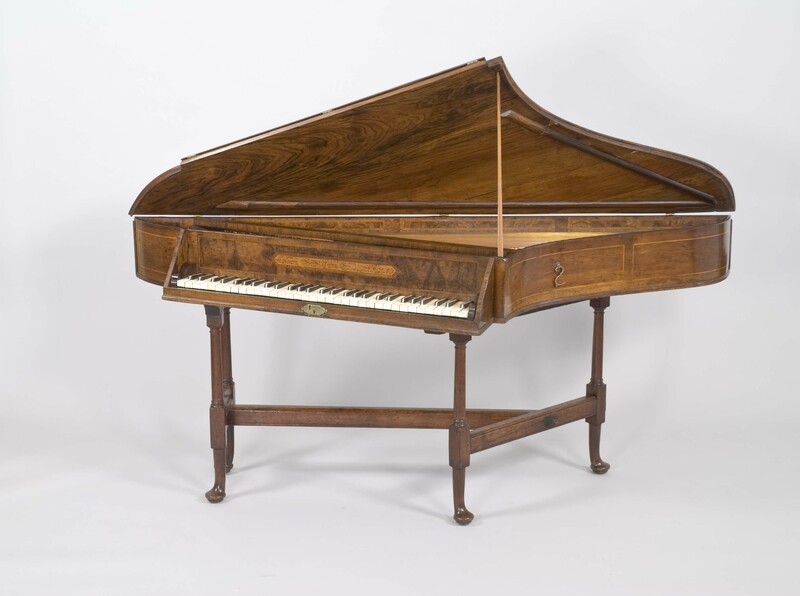 Let me say here publicly that without her assistance and initiative, the spinet would not be where it is or in the finished state and character that it possesses. Yes, most of the work is mine, but she contributed to its completion in many ways. My name goes on the nameboard, but it is proper and right that she has signed her name on the lowest key, in the traditional 18th century spinet practice. Final Nameboard, Keyboard and Mechanics Installed. In the coming weeks, now that I’m at a pausing point, I hope to post more blogs backtracking some of the interesting features of the work in its latter stages. First, a video (I think our first here) of the spinet being played; New drill methods; work on a simple music rack and other things that come to mind. Famous last words, I know, but some neat things have been discovered along the way. Oh yes, I have been advised to announce that the shop has a page on Facebook now. It will be more for quick, interesting photos and announcements, but will not replace this blog, which will continue to cover more in depth issues. As we can. Now, the question to myself is…. Can I actually do this again, and to the same level? Finished Nameboard, Keyboard and Action In Place. Brian Weldy built himself into this blockfront desk. It’s a bit embarrassing writing with the realization that we have been silent for so long. The last post was about the next symposium. This will be about the same symposium, but we’ll have to call it the last symposium now. 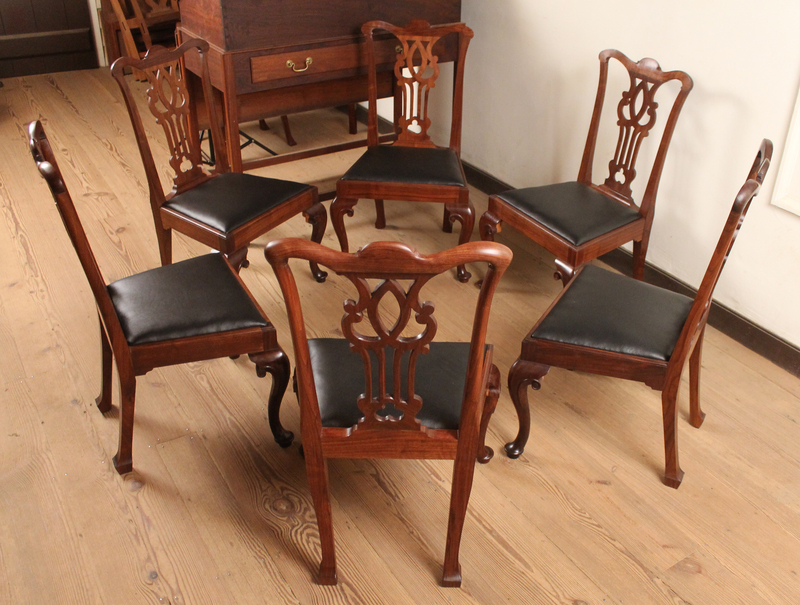 By covering a fairly broad topic like desks, we were able to span the entire eighteenth century in terms of style and construction. 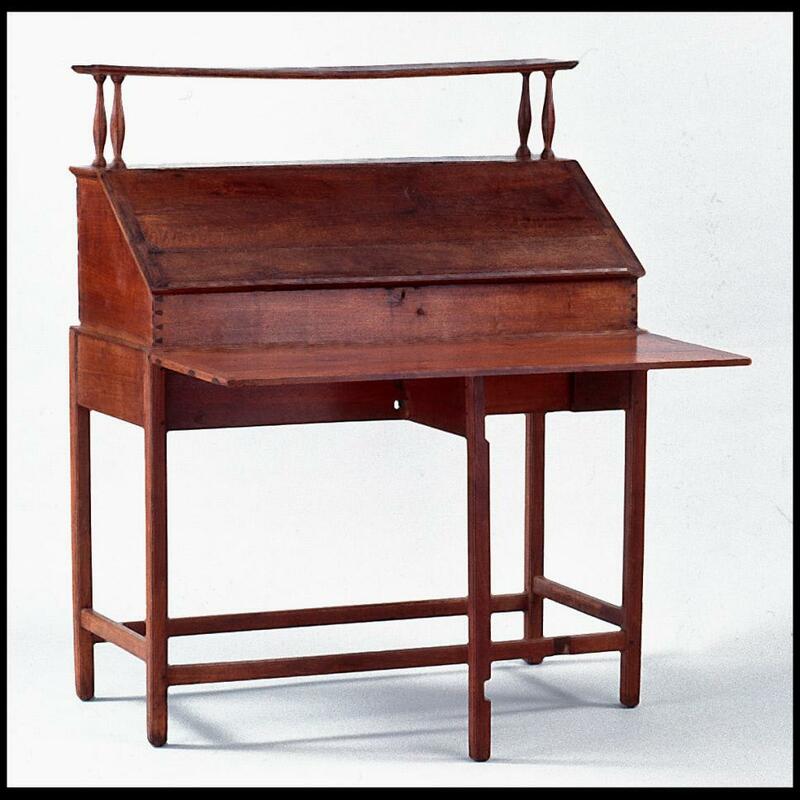 It is easy for woodworkers and writers to treat the eighteenth century as a single moment in time, a time in which people worked with hand tools, built great furniture, and dressed funny. Our aim was to juxtapose pieces and presentations to reveal substantial changes and surprising similarities in workmanship, design, and technique among early, middle, and late century pieces. 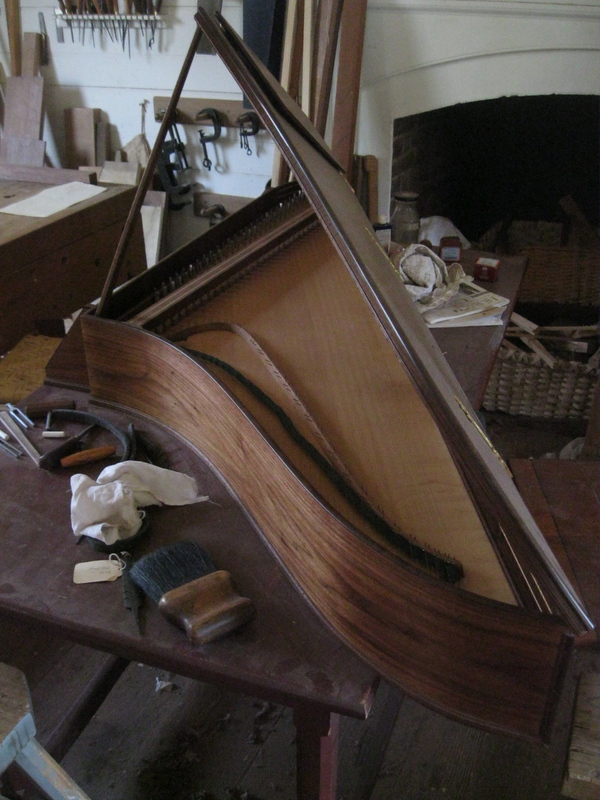 Handwork was different in 1707 (the date of our earliest piece) from what it would become ninety years later (roughly the time when the Seymours built the latest piece we explored). This, in turn, is different from how many people approach hand tool woodworking today. Changes in time and place, changes from one craftperson’s perspective to another’s, these are the things we hope to bring out as we move through these conferences. To that end, we all learn a lot from the insights of our audience. Insights that support, contradict, or challenge our assertions are precisely what make these symposia a valuable experience. All of us in the Hay shop are grateful for all who attended and were willing to get down and dig through the arts and mysteries of eighteenth century work with us. For those of you who have never been to one of these, here is a small sampling of what came to pass over our two sessions of this year’s conference. We look forward to seeing you next year! Look for more active blogging in the coming year and the launch of our Facebook page in the coming days (we are only several years behind on that one). 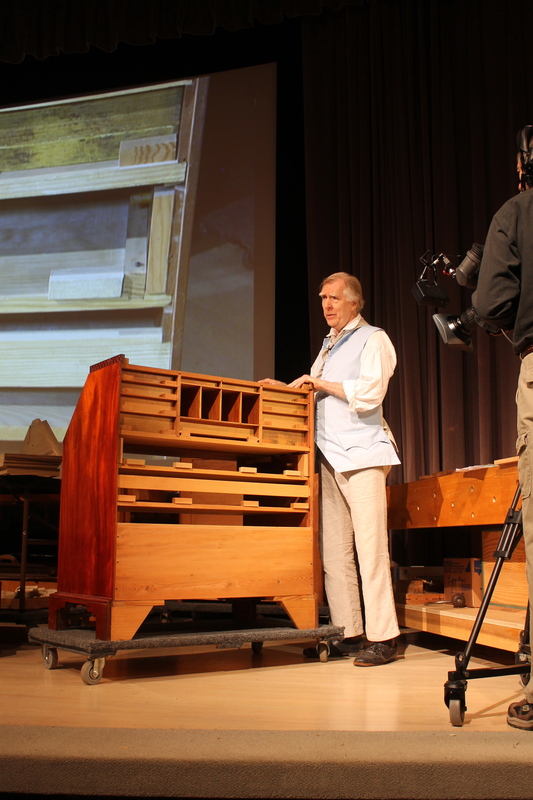 The Hay Shop’s leader, Kaare Loftheim, guides the audience through the many structural and aesthetic refinements found in a Norfolk, VA made desk and bookcase from the decade preceding the American Revolution. The original is on display in the museum gallery right above the auditorium. This is a reproduction Kaare built some twenty-five years ago and usually resides here in the shop’s ware room for all to examine. 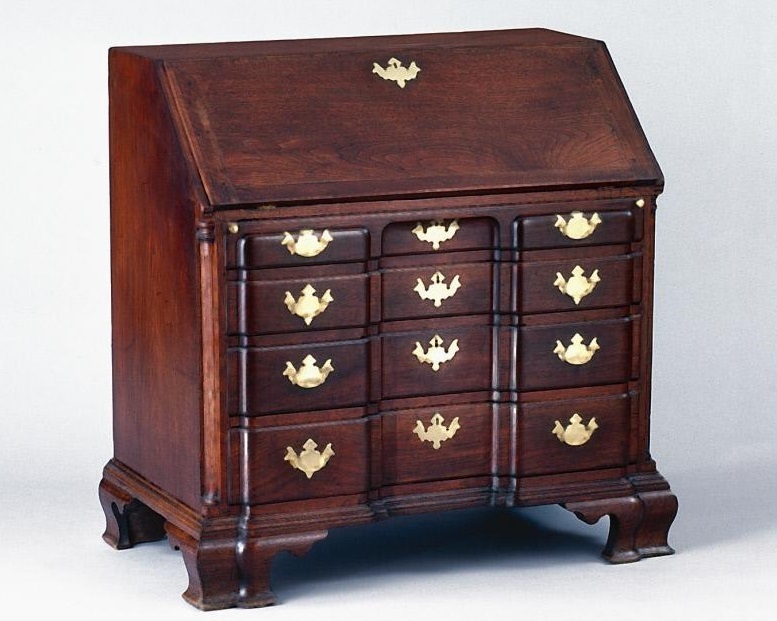 Tara Chicirda, Colonial Williamsburg’s curator of furniture, opened the conference with an in depth look at the evolution of various desk forms. She also prefaced presentations by offering a curatorial perspective on the pieces being demonstrated. Her increased role in the symposium was greatly appreciated by all of us and those in attendance as well. Brian Weldy demonstrates one of many sculptural methods employed to reproduce a Norfolk, VA blockfront desk. 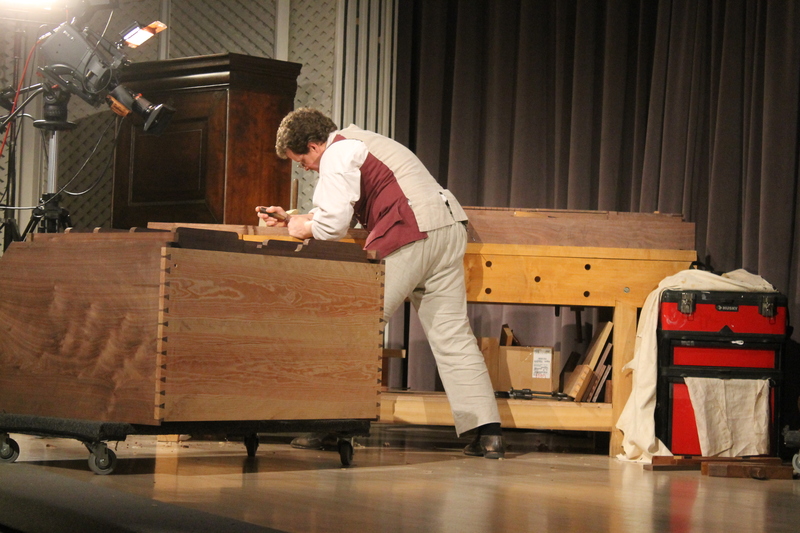 Bill Pavlak demonstrates resawing techniques in Atlantic white cedar, the wood used for drawer bottoms in the 1707 Philadelphia escritoire he presented. 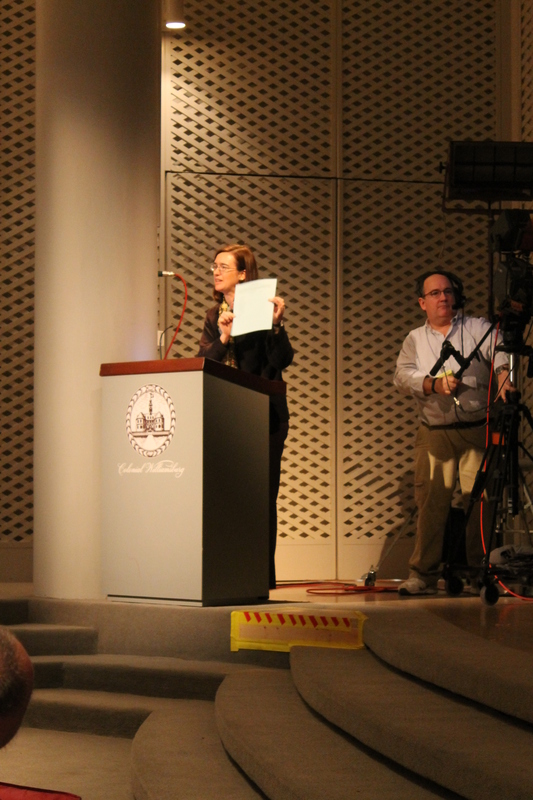 Notice the large screen and fine detail oriented camera work that are an integral part of every conference. Guest speaker Rob Millard demonstrated many aspects of a Seymour lady’s writing cabinet including the decorative inlay work on this tambour door. Rob’s skill and humor were a very welcome presence. 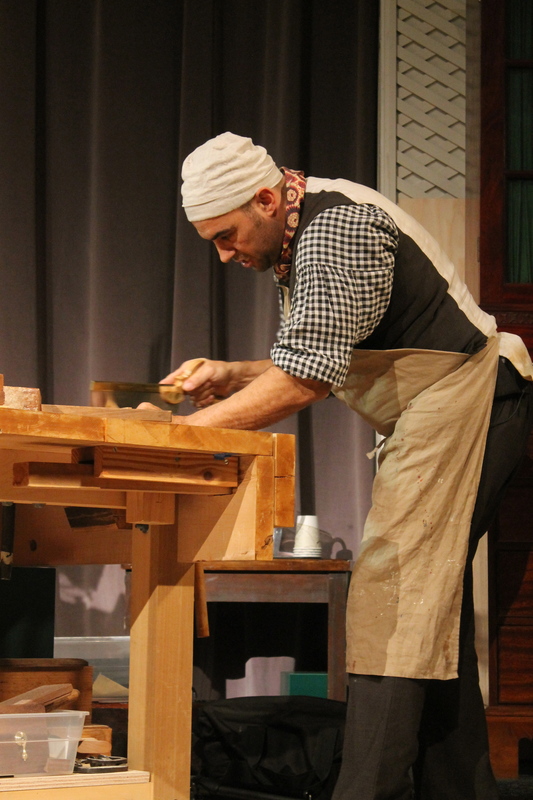 Ted Boscana, leader of Colonial Williamsburg’s joiners shop, demonstrated wedged dovetail construction as part of his exploration of a Virginia desk on frame. Here’s to a new year of woodworking! We’re excited yet saddened with our preparations for the January 2015 Working Wood Symposium. This will be the first symposium since its inception in 1999 that our director, Jay Gaynor will not be present. The Working Wood Symposium was Jay’s baby, and it’s not going to be the same without him. Jay was excited with the theme of desks and the pieces we had chosen. Entitled ‘Desks: The Write Stuff’, the program will feature four very different desks presented by Bill, Brian, Ted and I, as well as a Seymour lady’s writing desk with tambour by guest presenter Robert Millard. Bill will be presenting the earliest piece, a Philadelphia scriptor. 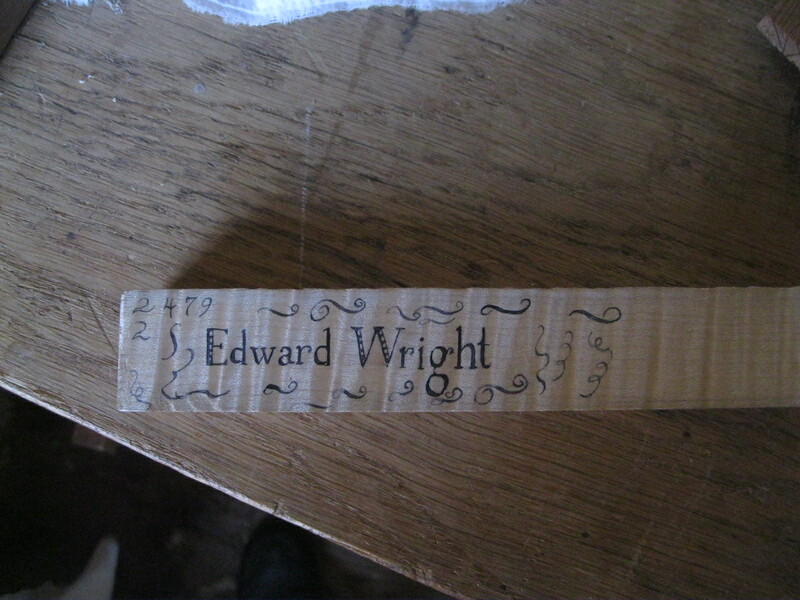 The maker, Edward Evans did us the favor of stamping his name and date, 1707, on the inside of the case. Turns out that it’s the earliest dated Philadelphia case piece! This will be an interesting exploration. Ever heard of a southern block front? Sounds like an oxymoron to me. 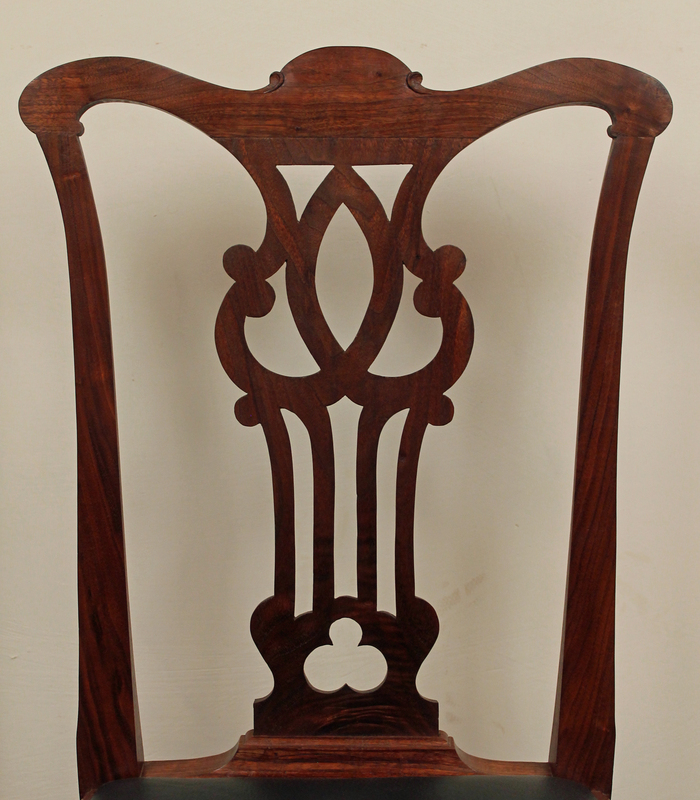 We’ve got a beautiful example in our collection, probably by a Norfolk, Virginia maker. Brian has been dressing out stock for his presentation of this desk. These two pieces are quite a contrast with some of the urban English cases being made in tidewater Virginia. I’ll be looking at the Galt desk and bookcase in detail. There are some interesting structural and aesthetic refinements that we’ll be exploring. 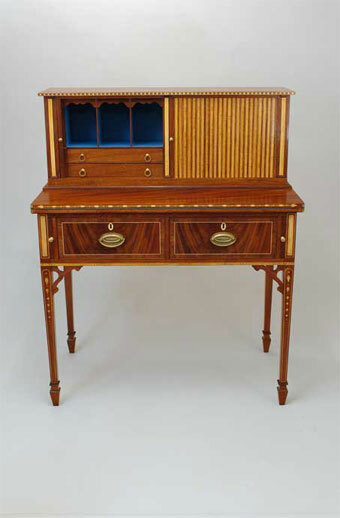 Finishing out this century is an exquisite Seymour lady’s writing desk with tambour. The federal period is Robert Millard’s niche. Below is a piece from Robert’s web site, americanfederalperiod.com. We’re still canvasing museums for the particular piece to present. 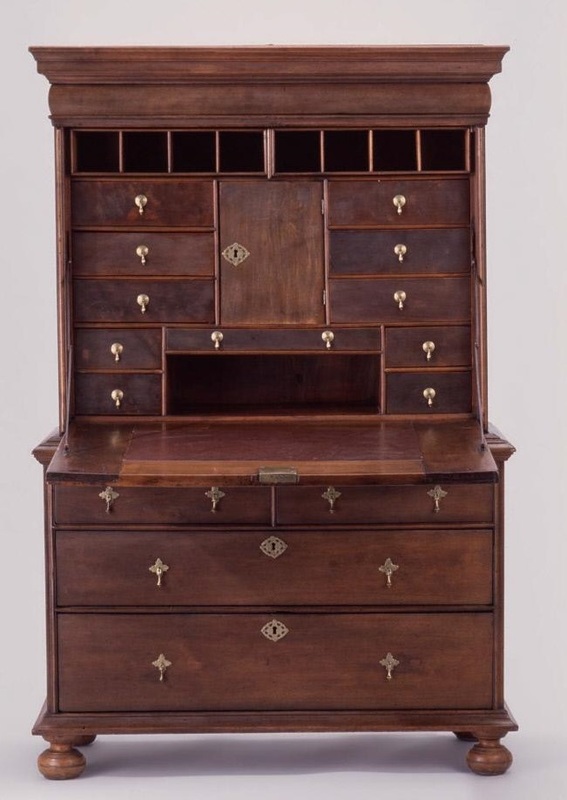 And finally in contrast to all of this is a utilitarian piece, a desk on frame from the Virginia Piedmont. Ted Boscana will take a brief look at some of the idiosyncrasies of this country piece. As always there will be a lot of action, good food, camaraderie, tools, tours and entertainment. 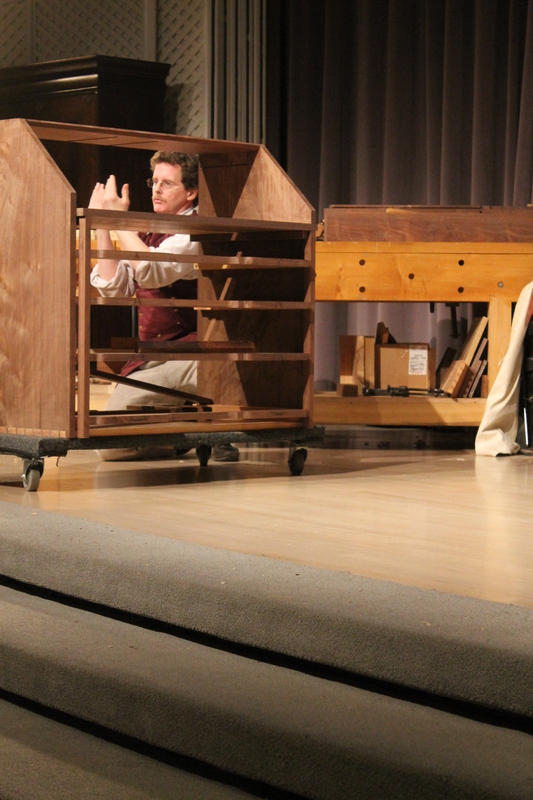 The full program will be posted in a couple of weeks on the Colonial Williamsburg web site. Till then, in the words of Jay Gaynor, “keep calm and carry on”. We have lost a leading light. Jay Gaynor, Director of Historic Trades, died suddenly yesterday morning. Needless to say, all of us tradesmen and women here are in shock. Jay possessed a consummate knowledge in his chosen field of historic technology. But he wore his erudition easily. And he encouraged us all to know more and find out more. But not just having information was enough. He always looked for ways to make giving that knowledge fun, interesting and very cool. He was interested in everything, from tools to his hobby of longbow shooting. And he was generous with his time and his knowledge. And he had a disarming sense of humor that kept us knowing that we should be serious… but not deadly. 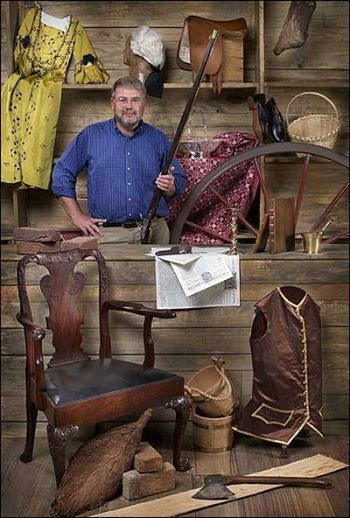 Probably his singular achievements, from our point of view: the 1995 award-winning exhibition Tools: Working Wood in the Eighteenth Century with its accompanying book he co-authored with Nancy Hagedorn, all this done while he worked as Curator of Mechanical Arts for CW. 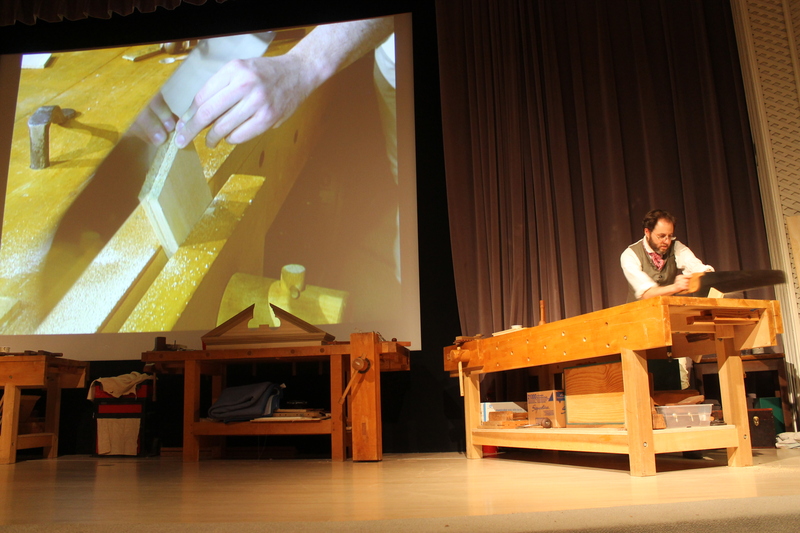 And of course, his major brainchild: the Woodworking Symposium, held every January for the last 16 years, bringing so many of us, professionals, history buffs, and hobbyists together. Most importantly, he expected and trusted all of us here to be professional and thorough, as employees, as artisans, as historians, as people. That was how you earned his respect and his gratitude. Jay was initially reluctant to take the reins of Director. He enjoyed his work as a curator tremendously. But as he subsequently proved, he was uniquely qualified for his position skippering this huge ship of Historic Trades, by his knowledge, his generosity and professional demeanor. All with a light, but firm touch. Ladies and Gentlemen, would you please rise up, drink a parting glass, and honor the man. Thoughts and prayers for his friends and family. Your comments and remembrances are welcome below.